Creative Card Crew is having a challenge this week with the theme "For Mom". Please head over to the Creative Card Crew blog and enter your card here. The idea for this card came to me when I saw the big flower on a stamp from Whimsie Doodles. The stamp is called "Go Big". I just used the flower and not the gnome in the stamp. The leaves from this flower came from another Whimsie Doodles stamp called "So sweet". Digital stamps make it so easy to use them in many ways and sizes. I only used the leaves and not the strawberries from the stamp. The paper used on this card is from K and Co. called Life's Little Occasions. This stack has some great papers in it! I also added two little bumble bee buttons. What are you doing for Mother's Day? It is almost here. Very sweet! Fantastic little bees! Thanks for playing at Kaboodle Doodles and good luck! Love your card! Beautiful detail and coloring. Love the clean and simple look! a beautiful, stylistic card Dawn....thanks for sharing with Fairy Fun Fridays! Wha ta beautiful card. I love the colors. Thanks for joining us at Aud Sentiments. Perfectly CAS! Great colors! A super mother's day card. Lovely spring flowers, april showers creation! Thanks for flying with the fairies this week at FFF! What a sweet card! I like that you used the border punch on the patterned paper, I'm always afraid it will never look right lol. Thanks for playing along with PaperCutz! I really like your card for mom! The stamps are fab! I´m still thinking about the email I got from you. You´ll hear from me soon! Just so much to do right now. Thanks for joining us at Charisma cardz this week! Love the edge punch you used. Dawn, really love the card! And the bumble bee buttons are a great addition. 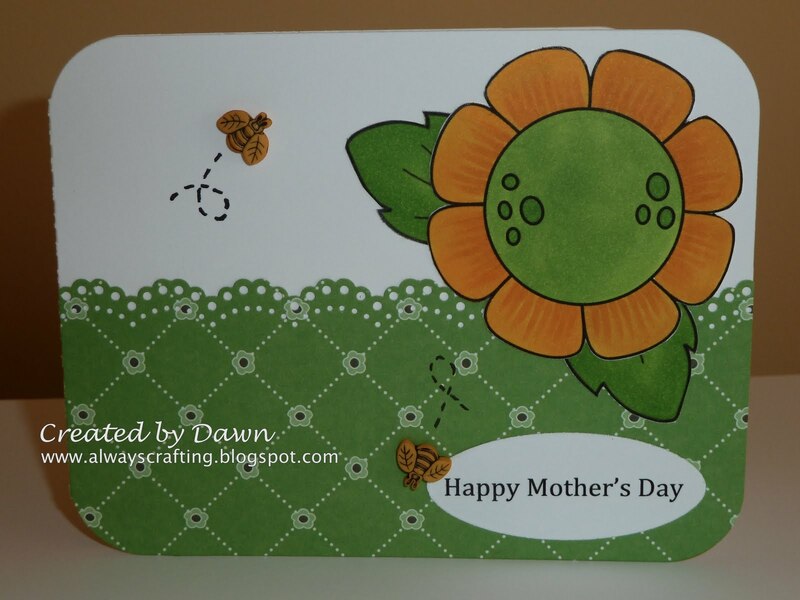 This is a beautiful card Dawn, what stands out for me is your choice of patterned paper and punched border. Thanks for joining us this week at Party Time Tuesdays. Danie - PTT Design Team. What a great card, Dawn! Great card, love the bee. Thanks for playing at Aud Sentiments. What a beautiful design Dawn! I just heart Whimsie Doodles, Melyssa is so awesome. Beautiful merging of images, I just love the happy colors and sweet bees. :) Thank you for playing along with us at TPE sketch challenge this week!